The Royal Canadian Mounted Police (RCMP), along with the Coroners Service of British Columbia, reportedly confirmed the find was, in fact, a human foot. “It’s an ongoing investigation. There’s no risk for the public at all,” RCMP Constable Sean Heidman advised. The foot is the 13th found along British Columbia’s coast over the past 10 years. Four other feet were found washed up in Washington state, for a total of 17 feet since August 20, 2007. Four pair of the feet matched. Most were right feet and all have been wearing either running shoes or hiking boots. Among them were three New Balance shoes, two Nikes and an Ozark Trail. Sources: Casey Quackenbush, Time, December 11, 2017; Nicole Darrah, Fox News, December 12, 2017; and Yanan Wang, The Washington Post, February 11, 2016. It's really strange that only feet have washed up. The article says that four pair of the feet were matched, so why did only their feet wash up and not their hands or arms or some other part of their bodies? At one time, people thought a medical student, or someone working in a morgue, might have been dropping dismembered feet on the beach as some kind of joke, but looks like that was wrong. Still, it could be a serial killer with a macabre sense of humor who cuts off his victims' feet and drops them on the beach where they'll be found. Another human foot has been found on British Columbia’s southern coast, this one discovered on a beach on Gabriola Island. Around noon on Sunday, May 6, a man walking along the shore near South Road found a foot inside a hiking boot stuck in a logjam. RCMP and the B.C. Coroners Service are investigating and attempting to identify the remains. Shoes with disembodied feet that have been washing up along the B.C. coast have mystified people in the province for more than a decade. In excess of a dozen feet have washed up along the B.C. coastline since 2007. The feet have been found on Vancouver Island, the Southern Gulf Island and Vancouver beaches for more than a decade. The B.C. Coroners Service says the 13th foot was discovered on the province’s coast back in December. Officials have not offered an explanation as to why the feet keep showing up on the B.C. coast, although the coroner’s service indicates that foul play was not involved in the first 12 feet. Source: Julian Kolsut, CHEK, May 7, 2018. I recently read an article explaining this phenomenon. It said that it was not really surprising, nor mysterious. It stated that there are many deaths that occur in or near the ocean, especially suicides or accidents. The reason why the feet are found more often than any other body part is that often the person is wearing shoes when they go into the water. The shoe protects the foot from decay, and also it makes them very buoyant. The shoe also protects the foot from being eaten by marine animals. People die from accidents and commit suicide in or near the ocean all over the world, so why aren't feet washing up in other places? If I remember correctly, the article said it was due the particular ocean currents in certain places. EVERETT, Wash. – The year 2019 began with the discovery of another foot. On New Year’s Day, the 15th foot was found at the south end of Jetty Island, a long, narrow piece of land in Everett. Officer Aaron Snell of the Everett police found no other remains. It is not clear how long the body part had been on the beach or how and where it was severed. The police department and Snohomish County Medical Examiners Officie are investigating. For the past several years, the currents of the Salish Sea washed severed feet onto the shores of the Pacific Northwest, a phenomenon that has been covered by NPR, The Washington Post and The New York Times. The feet are always protected by either a running shoe or hiking boot and those that have been identified have been matched to individuals who committed suicide or died by misadventure. The subject foot was wearing a boot. The discovery follows a report from the Royal Canadian Mounted Police in May that a man found a lone right foot wearing a hiking boot wedged between logs on Garibola Island near Vancouver. 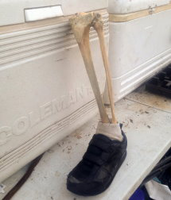 In December 2017, a foot, with the tibia and fibula still attached and wearing a black velcro athletic shoe, was found along a beach in British Columbia and traced to Stanley K. Okumoto, 79, who went missing in September 2017. It turns out that severed feet washing up on this coastline is, in fact, “A Thing” that has been fascinating Canadians, Americans and the media for years. The phenomenon even has its own Wikipedia page. The British Columbia Coroners Service has even produced a handy map, however, it doesn’t show the latest find – yet. Though morbid and grisly to some, according to scientists and health officials, there is nothing sinister about these finds. They aren’t the handiwork of a serial killer or the remains of plane crash victims, as some have opined. Instead, the experts claim several innocent scientific phenomena converge to periodically deposit human feet on the shores of the Salish Sea, the body of water between Vancouver and Seattle that includes Puget Sound and the Strait of Georgia. For starters, there are simply a lot of corpses in these waters, Kathy Taylor, a forensic anthropologist with the King County Medical Examiner’s Office, said, explaining the feet are a consequence of a densely populated region on the coast. The metro area along the shores of the Salish Sea is home to 7 million people. Suicides and drownings are somewhat common around bodies of water and as shoreline populations increase, water mishaps also increase. Coastal metropolises such as New York City regularly go through the grim ritual of fishing floating corpses out of the water in the spring as water temperatures rise. This said, severed feet also occasionally wash up around other bodies of water. In November, a lone foot wearing a sneaker was found in a trash bin next to a boat ramp on the Willamette River near Portland, Oregon. In 2017, a foot wearing an athletic shoe was discovered on a dock in Charleston, South Carolina, and hikers found a foot inside a tennis shoe on the banks of the Mississippi River near St. Louis, Missouri. Body parts, including a foot, washed up in Rio de Janeiro near the beach volleyball courts before the 2016 Olympics. Body parts of tourists also washed up on a beach in Fiji in 2016. Why feet? It turns out that in water, human bodies naturally disarticulate, or come apart at the joints, so hands and feet often separate from corpses after soaking in the ocean for a while. “Feet easily disarticulate and when they are attached to a flotation device such as a running shoe, they are easily washed ashore,” wrote Gail Anderson, co-director of the Center for Forensic Research at Simon Fraser University in British Columbia, in an email. “Notice there are no feet washing ashore in stiletto heels or flip-flops. Also, today’s running shoes are much more buoyant than in the past.” Tennis shoes also keep decaying feet in a neat “package,” as it were, and footwear protects feet from foraging sea creatures. “Anthropods will skeletonize and disarticulate a body quite quickly depending on oceanic conditions,” Anderson wrote. Though shoes keep severed feet intact, tracing them to their original owners has proven difficult. “The ones I have seen are not fresh feet,” Taylor dryly observed. “They’ve been in the water for a long time, with significant decomposition.” Often, DNA is too damaged to test because of the days or weeks spent in salt water and most of the time, there is nothing to which the DNA can be compared: Most people whose final resting place is the sea do not have genetic material on record. Other potentially identifying marks such as scars and tattoos are lost to the briny deep as scarcely more than bone and ribbons of flesh return to shore. Taylor is advocating for the inclusion of shoe size in standard missing person reports, a detail that could help identify the next foot that washes ashore. And of course, the news media gleefully jump in with both feet when another “foot story” crops up. Officials encourage people who discover human feet or other remains contact the police or the local coroner’s office before touching them. Sources: The Everett Daily Herald, January 2, 2019, and Umar Irfan, Vox, January 4, 2019.